Debuting two nights apart, The Brave and SEAL Team can’t quite be classified as identical twins, but if you choose to sample both of them, you’ll definitely notice a strong resemblance. Both are network action dramas revolving around elite military teams battling threats to our national security, and both kick off with a mission to rescue a blonde white woman from a notorious Islamic terrorist. 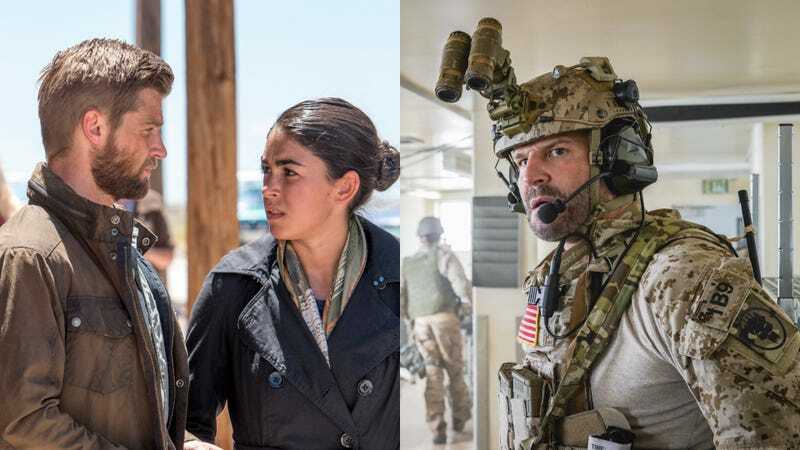 (SEAL Team isn’t even the first series about that particular special ops unit to premiere this year; that would be History’s Six starring Walton Goggins.) Neither show does much to distinguish itself in its pilot episode, but if you must choose one, there are a few minor differences that may aid your decision. 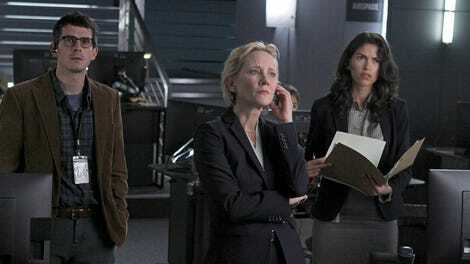 The Brave gets a head start Monday night on NBC. Anne Heche stars as “D.I.A.” deputy director Patricia Campbell, back on the job after taking some time off following the death of her son in combat. Campbell heads the brains of the Special Ops squad with her team of analysts from a gleaming high-tech command center in Washington, D.C. Captain Adam Dalton (Mike Vogel) leads the boots-on-the-ground team that puts the intel into action. Operating out of Turkey, his team of five includes communications expert Ezekiel “Preach” Carter (Demetrius Grosse), sniper Jasmine “Jaz” Khan (Natacha Karam), medic Joseph “McG” McGuire (Noah Mills), and new guy Amir Al-Raisani (Hadi Tabbal), who evidently hasn’t been around long enough to earn a nickname. When American doctor Kimberley Wells (Alix Wilton-Regan) is kidnapped by terrorists near Damascus, Syria, the team must scramble to find and extract her before her captors execute her for a worldwide viewing audience. The pilot episode ping-pongs between the analysts in Washington running surveillance and gathering intelligence, and the team in the field getting into firefights and infiltrating the hospital where Wells is being forced to save the life of a high-ranking Islamic terrorist. It’s a dynamic familiar from 24 (with an ensemble in place of lone operator Jack Bauer), but everything is resolved within the hour. The action is delivered with the sort of jittery camerawork and slash-and-grab editing that has long since become a cliché of the genre, but aside from Heche casting a few mournful glances at a photo of her dead son, The Brave is refreshingly free of obligatory domestic baggage. Its thrills are generic, but at least it stays focused on the mission. The same can’t be said for SEAL Team, CBS’ entry in the elite military adventure sweepstakes. Although it boasts more star power and a slightly higher grade of production value than The Brave, it also saddles its characters with the sort of personal travails that are meant to humanize them but generally only function as over-familiar padding. That’s particularly true in the case of team leader Jason Hayes (David “never not in prime time” Boreanaz), forced to bear the burden of several moldy signifiers of the troubled-but-noble hero. Not only is he separated from his wife and children, but he blames himself for the death of his longtime partner in the field. Creator/writer Benjamin Cavell doesn’t dig too deeply into the bag of well-worn domestic tropes for the pilot; he goes straight for the old “Will Dad show up in time for his daughter’s recital?” gambit in a half-hearted bid for empathy. Once the opening mission gets underway, it’s hard not to notice its striking similarity to that of The Brave, especially if you’ve watched them back-to-back. Once again an attractive young white woman has fallen into the hands of the world’s most dangerous Islamic terrorist and the team must choose between rescuing her and taking out the bad guy before ultimately figuring out how to do both. Hayes heads a squad that includes veteran operator Ray (Neil Brown Jr.), troubled-but-loyal Sonny (AJ Buckley) and the new guy, cocky Clay Spenser (Max Theriot of Bates Motel). Filling the Anne Heche role as the CIA analyst who oversees operations is Jessica Paré (Mad Men’s Megan Draper) as Mandy Ellis. Boreanaz lends more leading-man charisma to the proceedings than Vogel (who just looks happy to be out from Under The Dome), while Heche brings more authority to her role than Paré can muster. Both special ops teams feature diverse but bland supporting players, but The Brave gets points for better optics by including a Muslim member so one of the others can occasionally make the grudging admission that, hey, they can’t be all bad. Other than that, a nuanced approach to issues of representation does not appear to be in the cards for either series. Maybe the bad guys won’t always be Muslims—it looks like The Brave’s team is heading to Russia next week—but anyone looking for fresh takes and surprising perspectives on the war on terror would be advised to look elsewhere. This is the palatable prime-time version of our neverending conflict, delivering comforting resolution within the hour and reassuring us that no matter who is nominally in charge, our safety is in good hands. Maybe that will be enough to secure an audience for at least one of these shows (the combination of CBS and Boreanaz would seem to give SEAL Team the edge), but it makes for an uninspired and forgettable viewing experience in either case.